1. St Peterburg Road Construction, Russia. 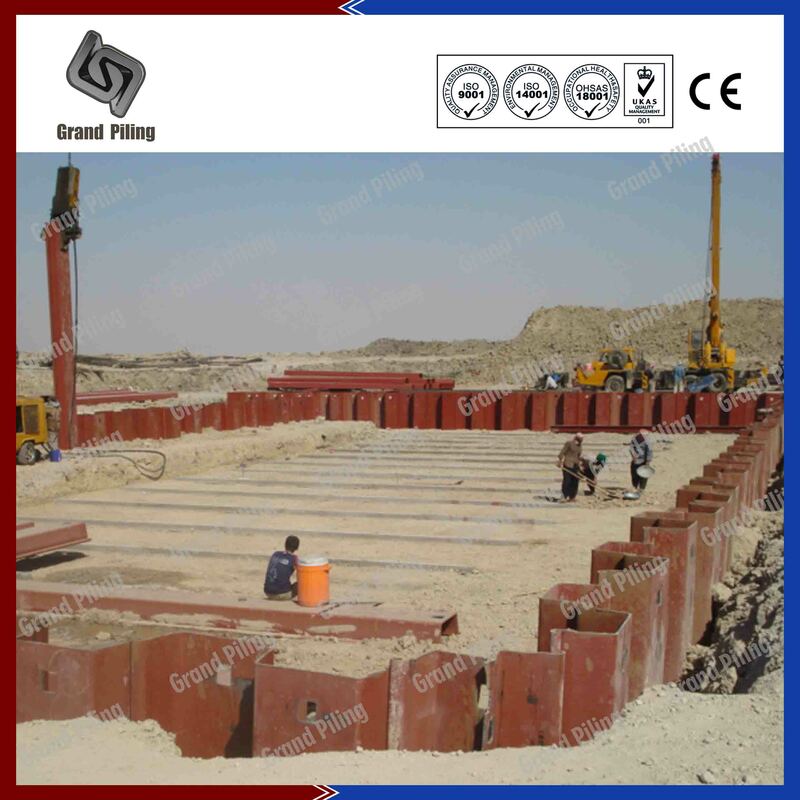 Project Details: Due to the hard ground and lower temperature in Russia,GPU32-700 700x560x12mm U type sheet piles are chosen. Totally 2500 tons are shipped in containers to St Peterburg port. 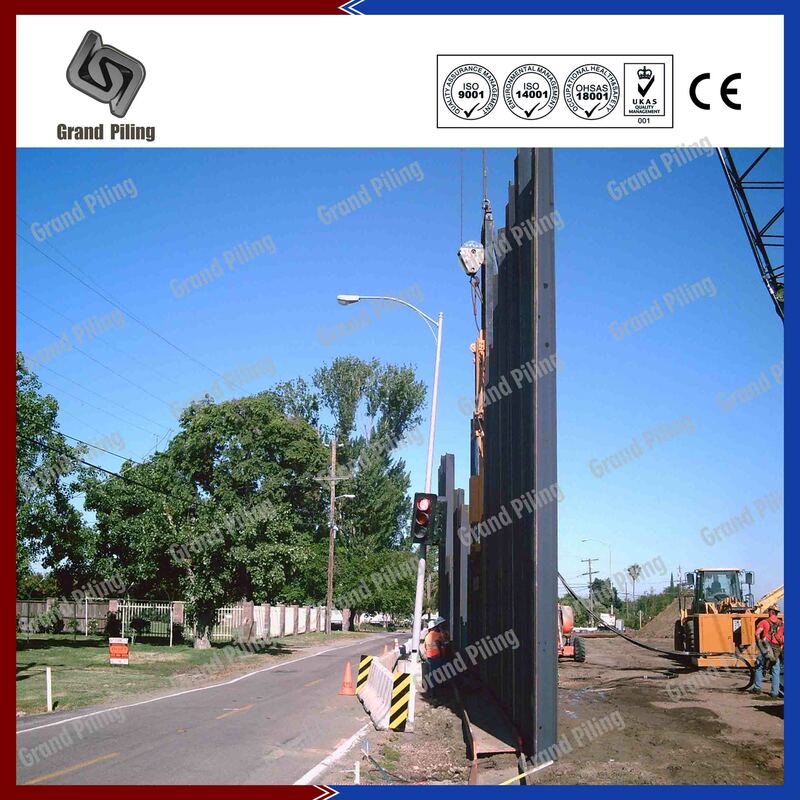 Different length were used to suit the site conditions and the design requirements. Due to the sloping nature of the excavation, retaining wall conditions were constantly changing along the length of the wall. 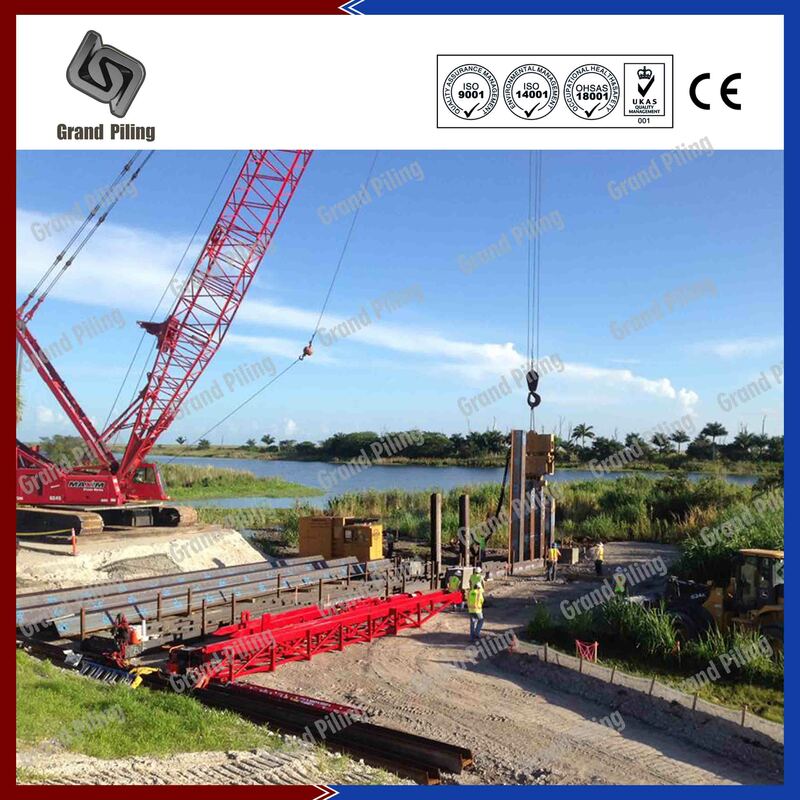 Installation of the sheet piles was carried out by vibrating the sheet piles to required level with a vibro hammer mounted on a 50T crawler crane. 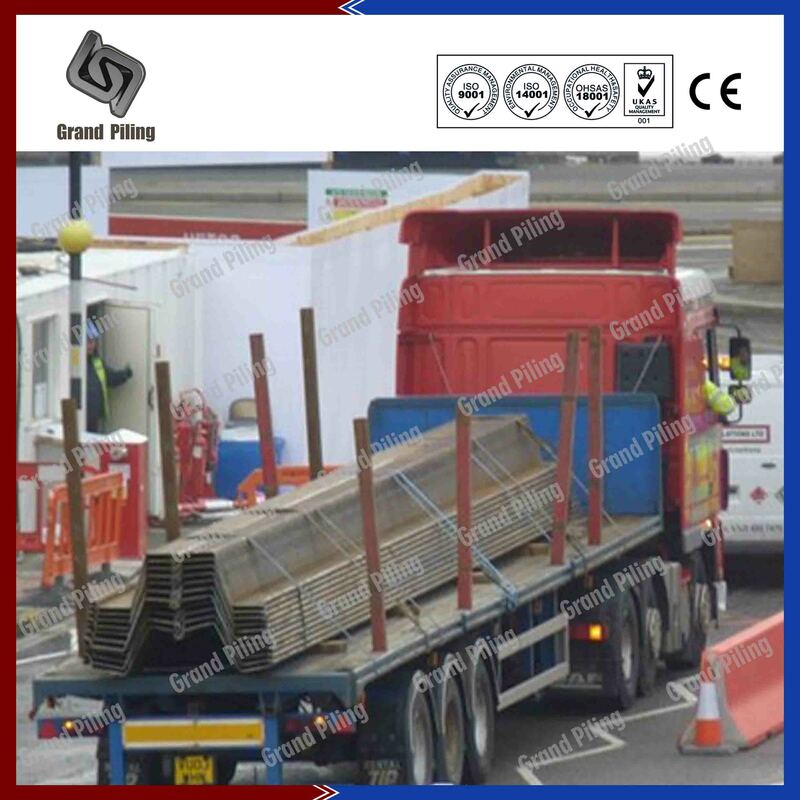 Due to the varying depth of hard stratum (depth of bed rock) pre-drilling was carried out to facilitate driving of sheet piles at some locations.Ground anchors were installed using a horizontal hydraulic drilling rig. The capacity and no. 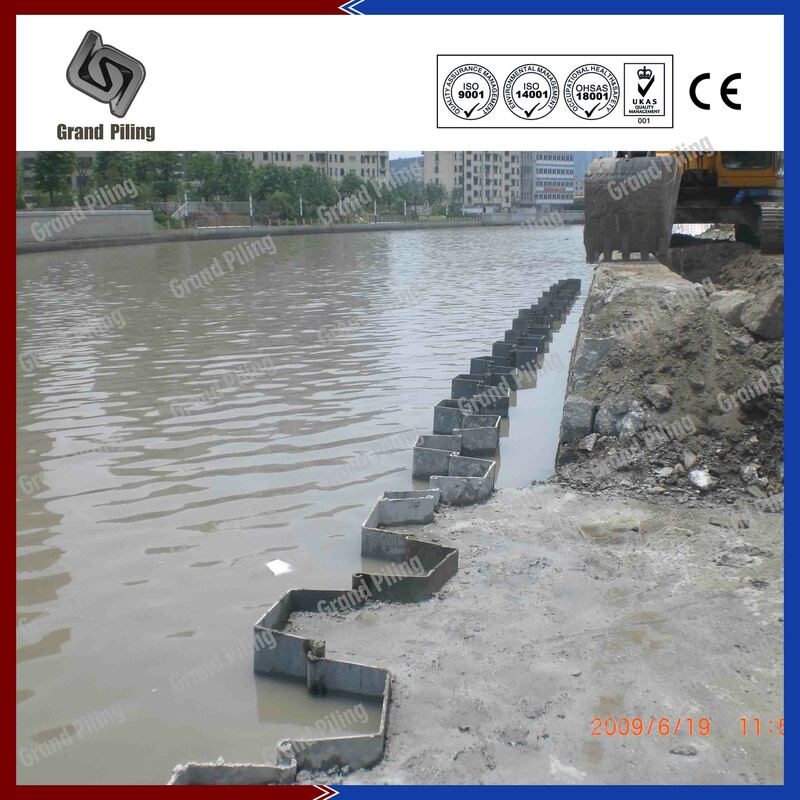 of levels of the ground anchors varied with the depth of excavation. A total of 311 anchors were installed with capacities ranging from 400kN (for shallow excavation) to 1,000kN (for deeper excavation, 10.5m depth). 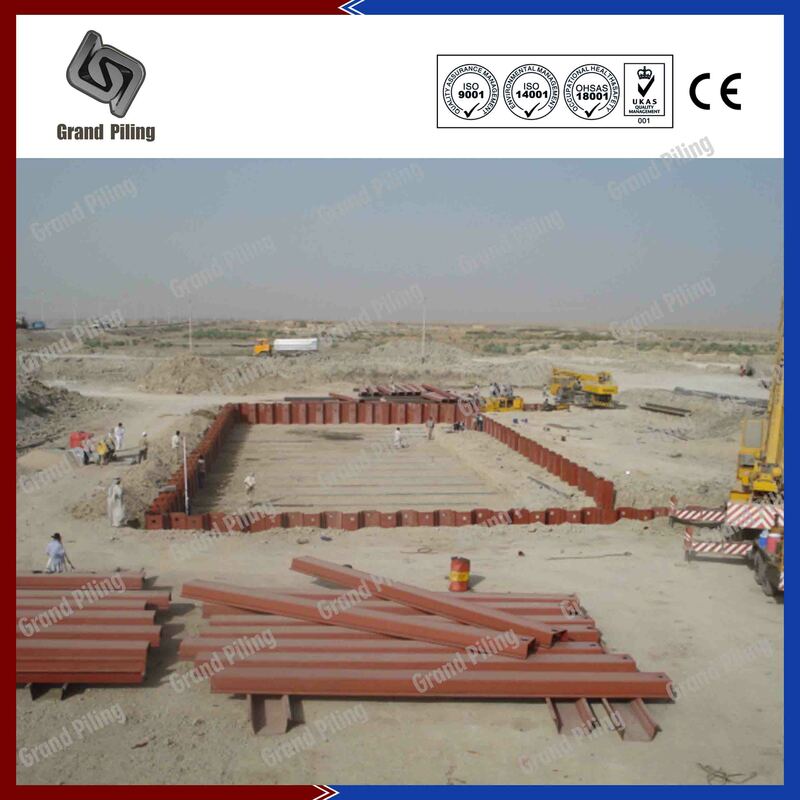 Project Details: 2510 tons of GPZ21 685x402x10 Length varying from 11.5m to 20m. 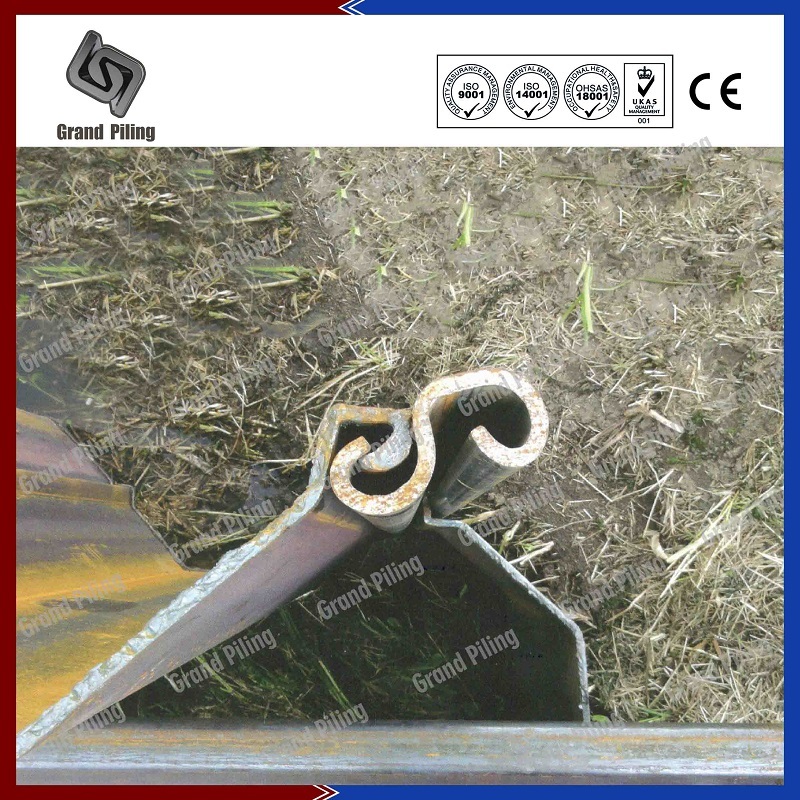 supplied in welded pairs. slinging holes.The soils consisted of firm to stiff sandy clay and the working load was 100kN. 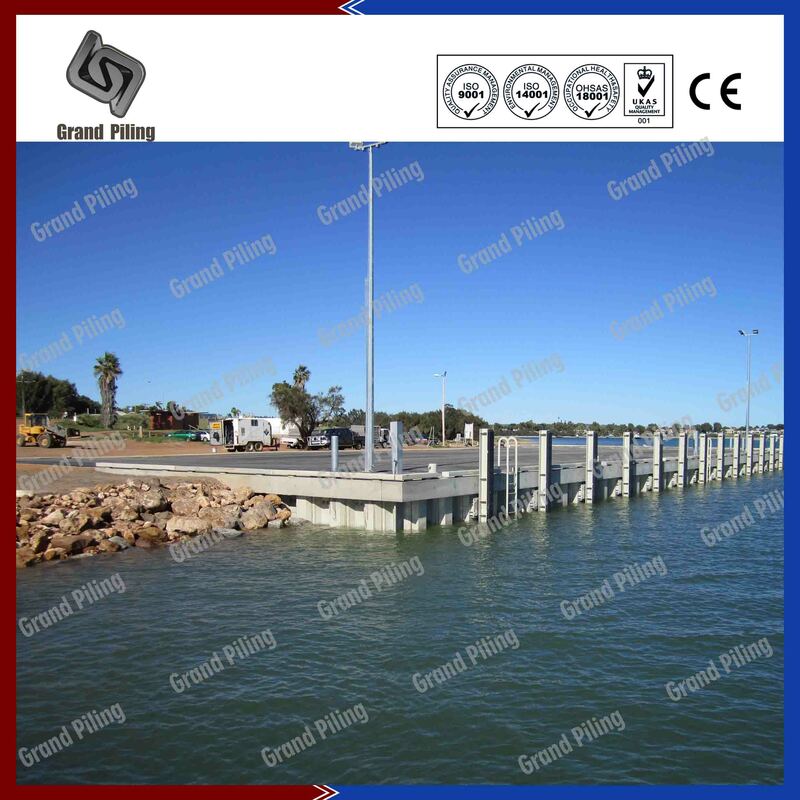 Access to the site for plant and materials was only possible by floating craft, and a temporary wharf 2 miles upstream was used for loading all plant and materials. 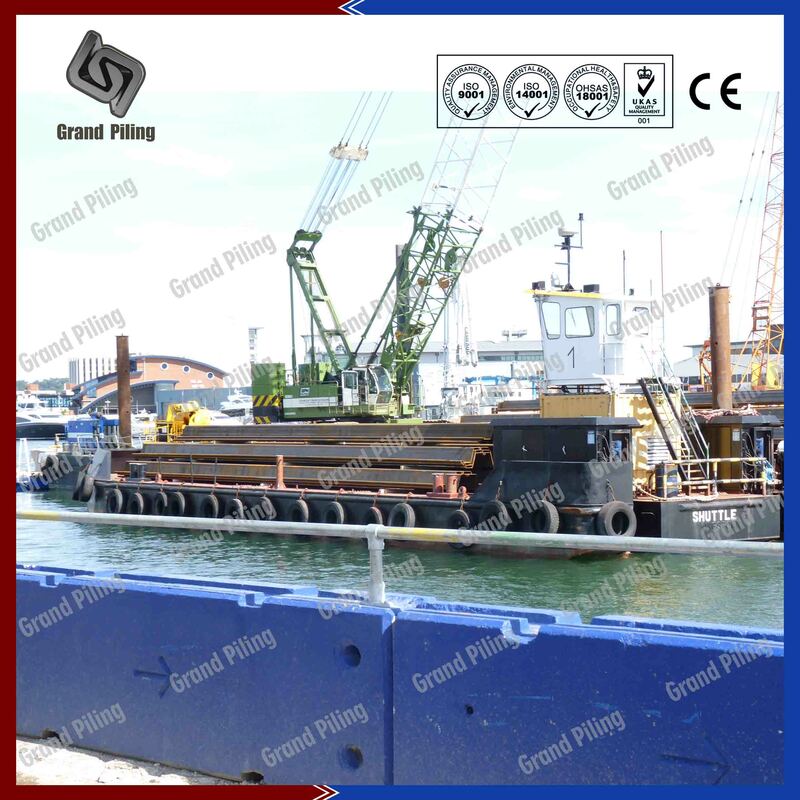 A spud leg piling pontoon, made up of 20 uniflotes, was constructed for carrying the piling plant and a further 6 flote pontoon was made up and used for transporting materials. 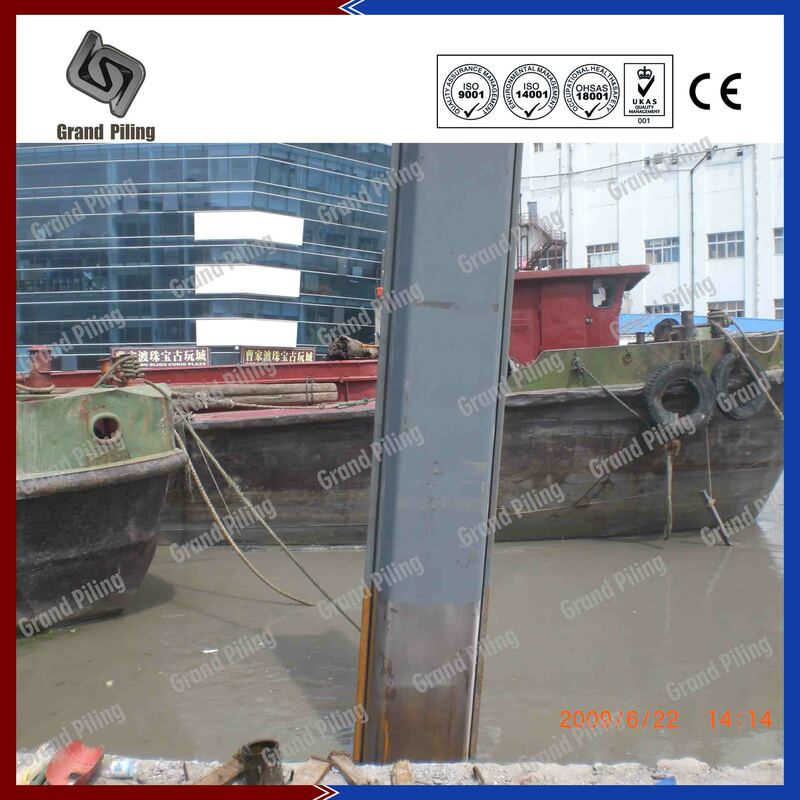 A 250HP workboat was used to move and position the pontoons. 3. Punta Colonet Project, Mexico. 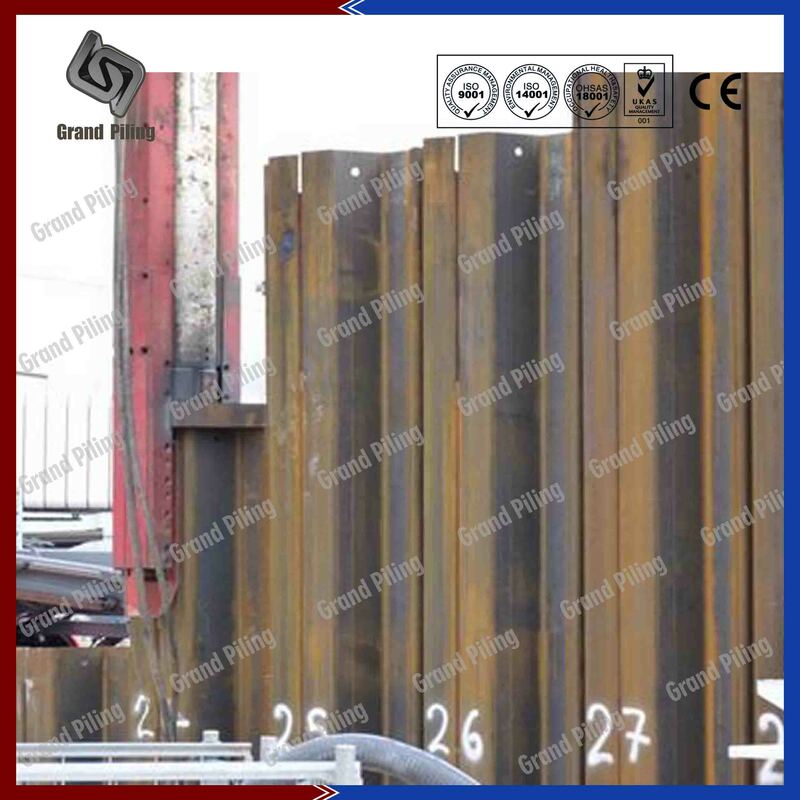 Project Details: 1800 tons of GZP18-700,GPZ26-700 were used in this project.Grand Piling supplied these sheet piles in welded doubles and top 6 meters are painted.The specified coating for the sheet piles is for shot blasting to SA2.5 followed by 2 layers of 250 micron Jotamastic 87. 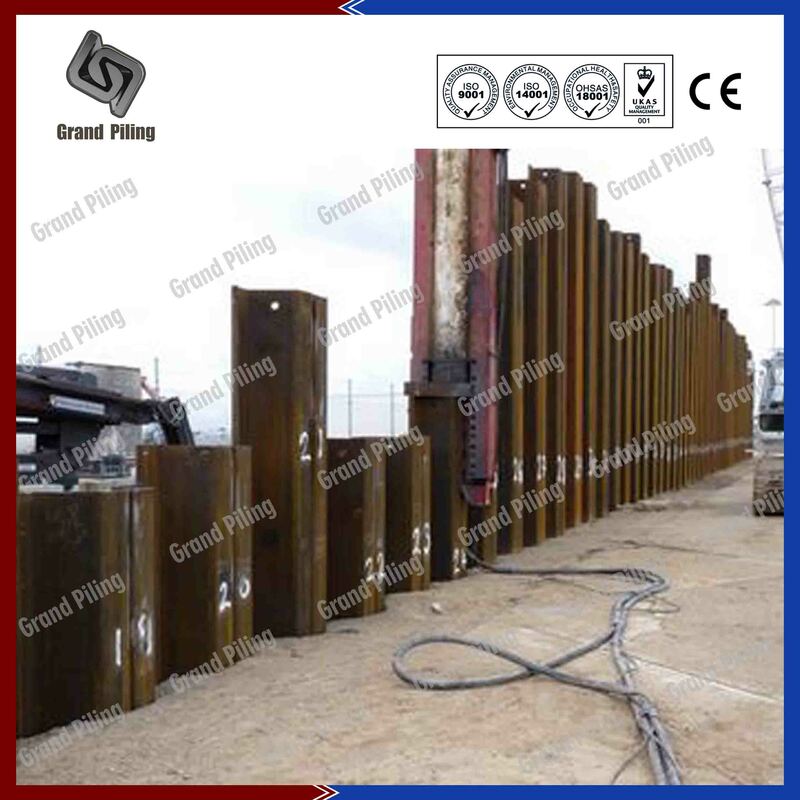 The coating was applied to the top 6.3m of the front .The design of the sheet pile system was performed in accordance with the requirements of BS5950-1. 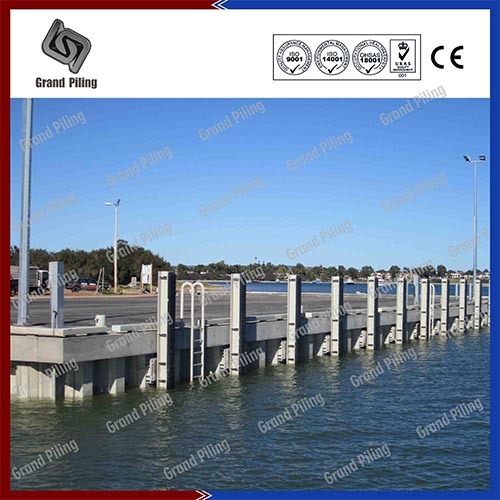 Corrosion was considered for a period of 35 years. 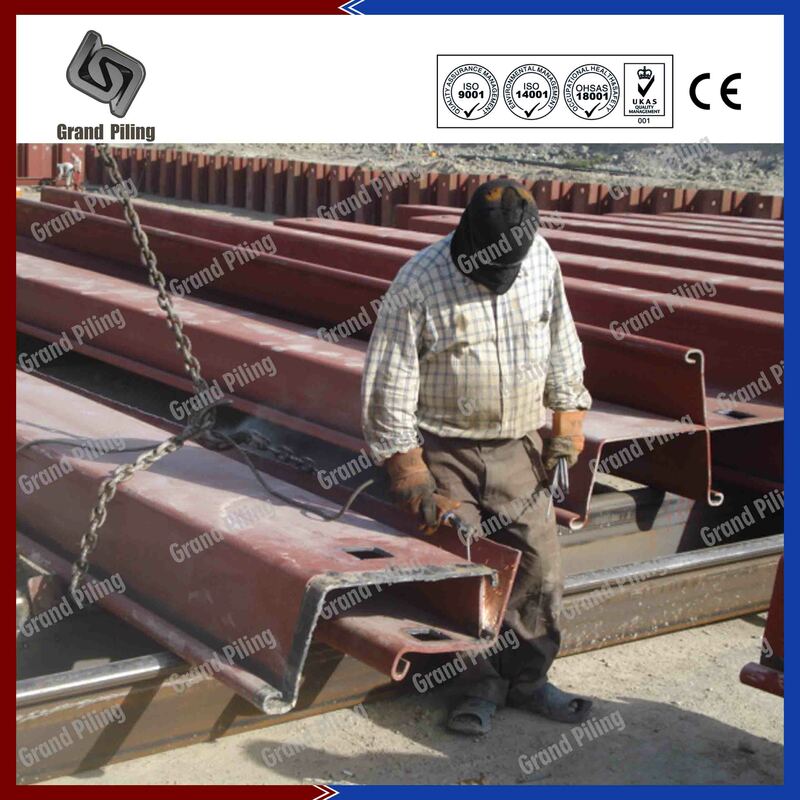 Capacity of the waling beam was designed to maintain a factor of safety of 1.2 in static conditions and 1.1 in seismic conditions. 5. AI Hallaniyat Island Project, Oman. 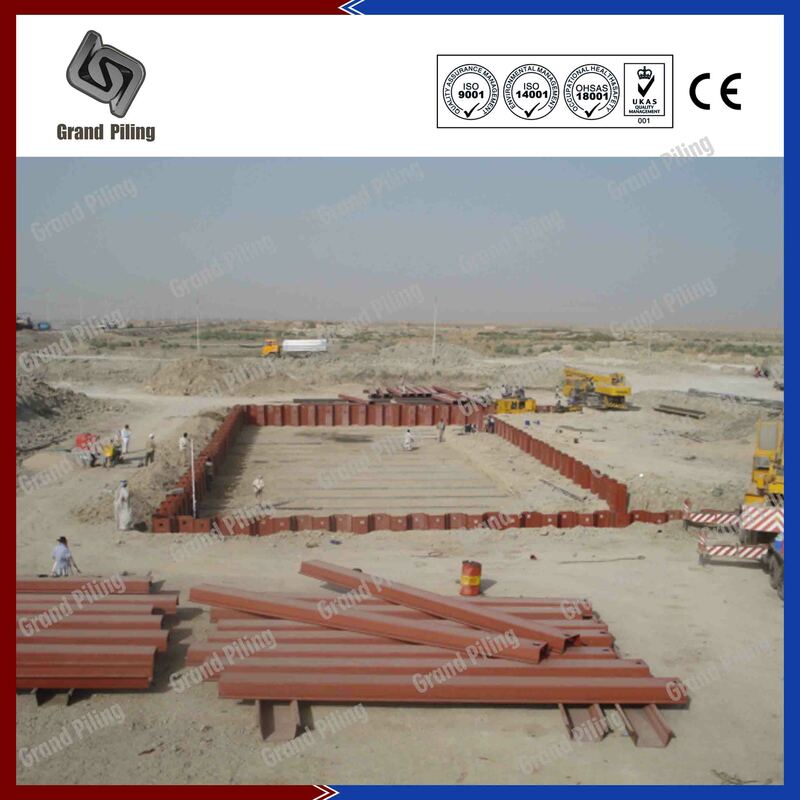 Project Details: 1870 tons of GPZ26-700,supplied in welded pairs by bulk vessels. 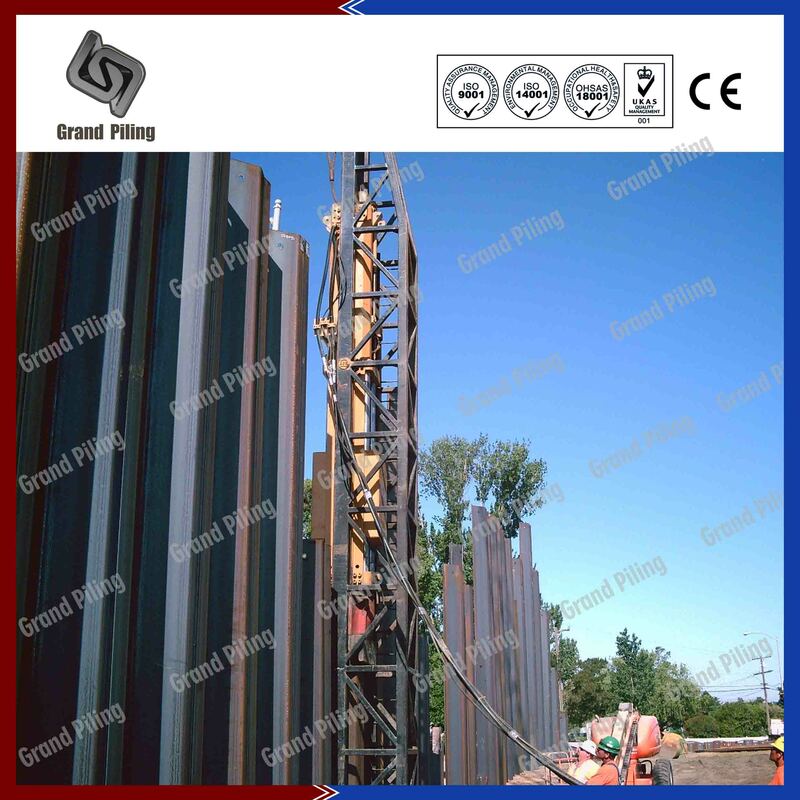 The clients has been in talk with Grand Piling half a year ago before the project starts. 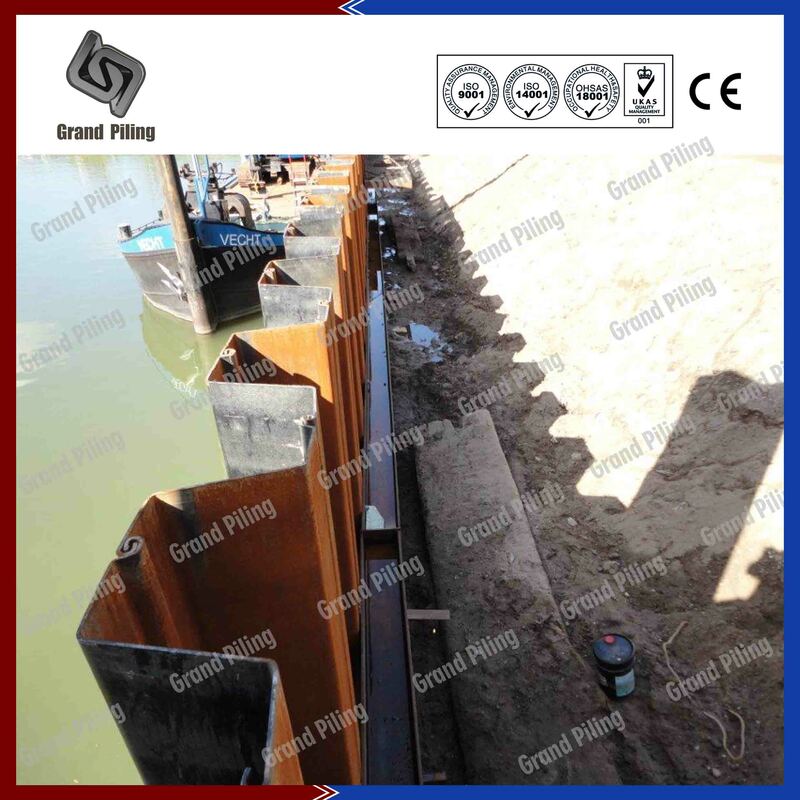 These Z profile sheet piles were installed using hydraulic jacking techniques. 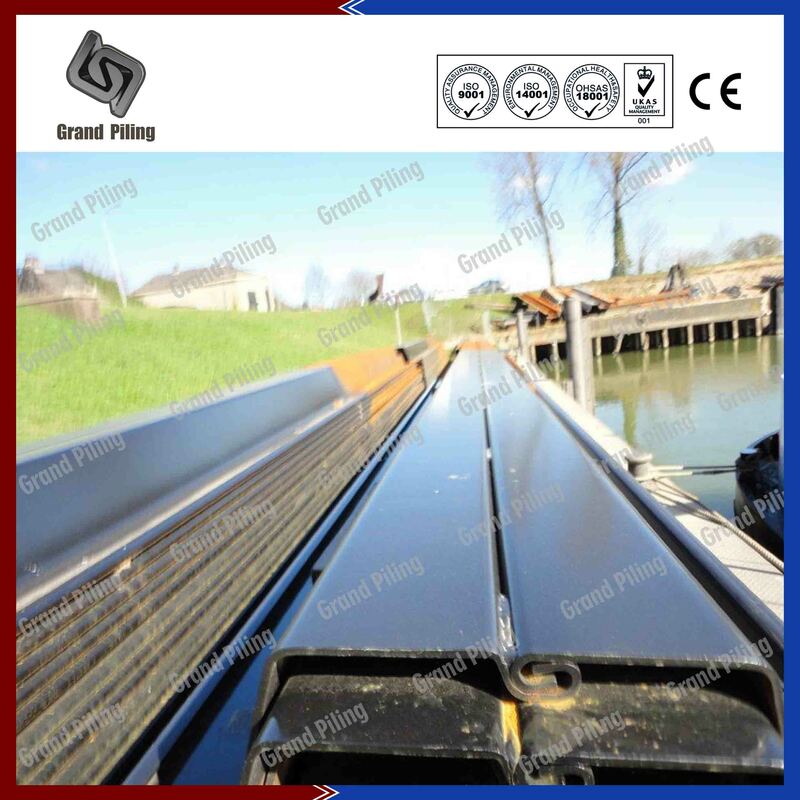 This method minimised vibrations which enable sensitive SNCF electronic equipment.The scheme was successfully completed on schedule and within budget, and complied with all quality and environmental requirements. 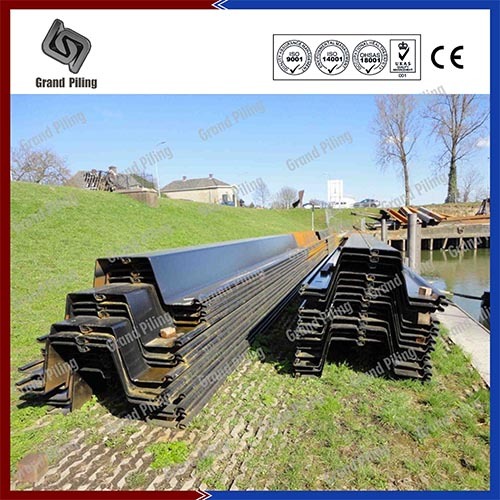 Two abutments were completed within two weeks and rail traffic was virtually uninterrupted; in fact the first wall of 54 sheet piles was jacked to an average depth of 8 metres in 5 working days, which included some temporary works. 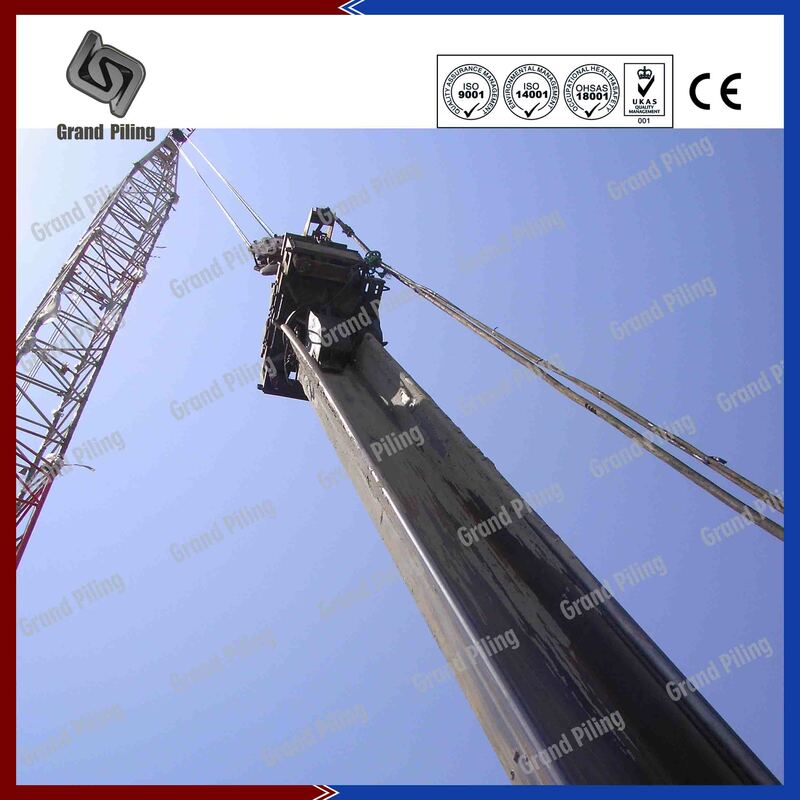 Grand Piling also gave lots of advice on drilling and handling of piles. 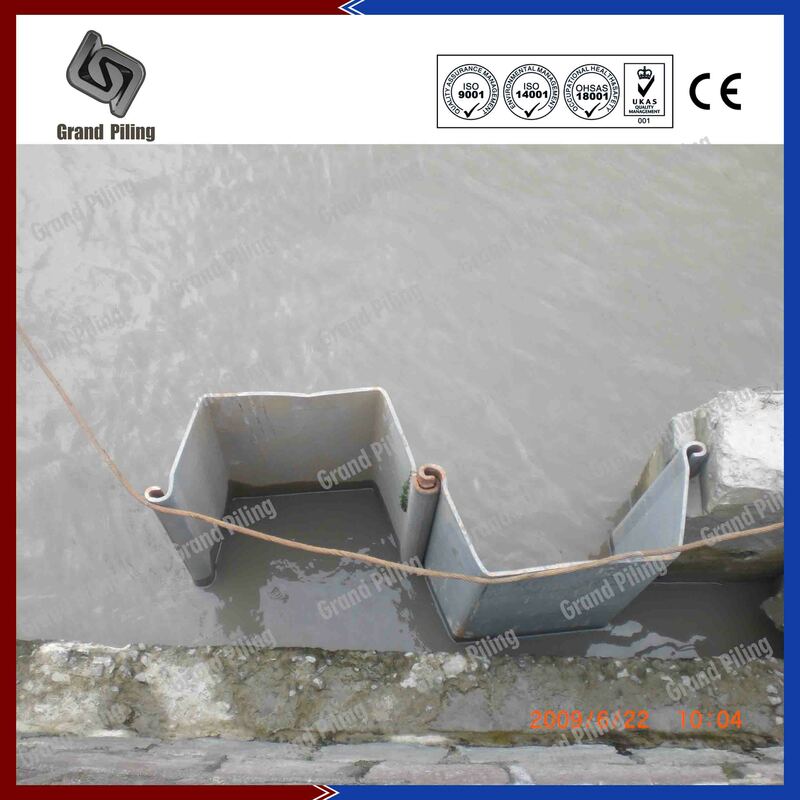 Project Details: GPZ11 635x304x7mm thickness. 1800 tons. 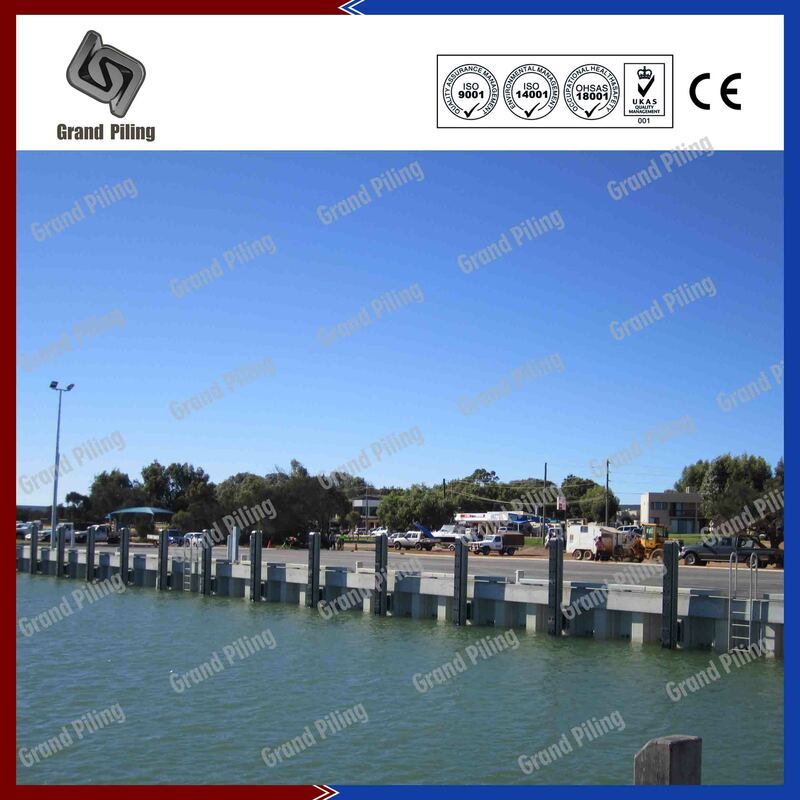 length from 5.8 up to 11.8m. 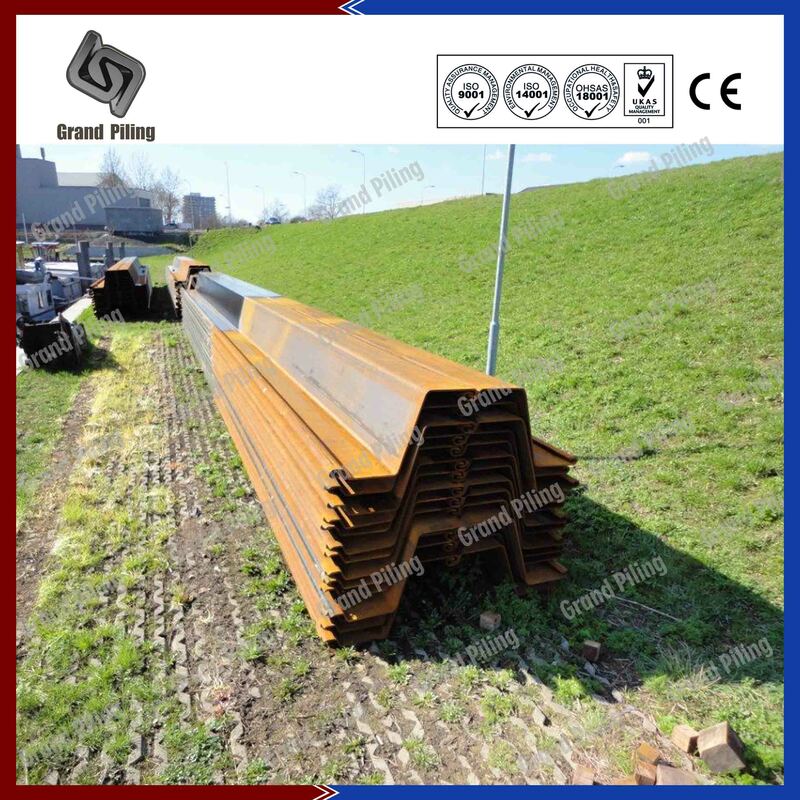 S235 steel grade.The delivery was splitted into sevral shipments,due to the urgent time required.The soils generally consisted of sand, overlying clay, overlying sandstone, with the water table being fairly high.The surrounding area of the site was mainly residential and approximately 57% of the total area of 12,100m2 was installed using the Silent Piling Vibration Free Pile Press. The remainder were installed using a Bauer Telescopic Leader rig and variable moment vibratory hammer. 7. 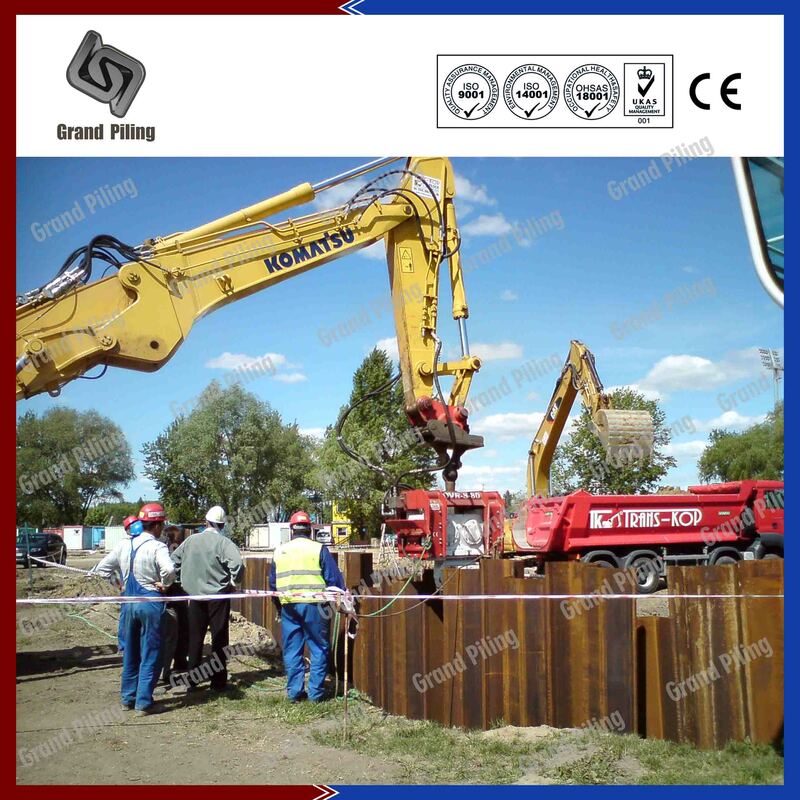 Amrun Offshore Piling Project, Australia. 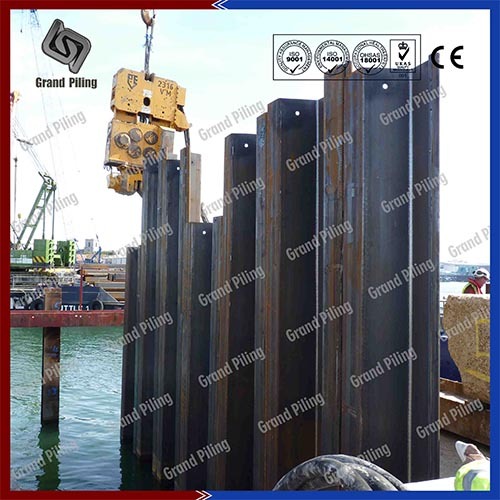 Project Details: Australia has been one of main market for cold formed sheet piles.In Perth,Adleide,Newcastle, Sydney etc,you can find lots of cold formed sections.For this offshore piling projects,AU25 was firstly the design.Due to the higher price and longer delivery time, the clients finally chose GPU26-650 as alternatives. 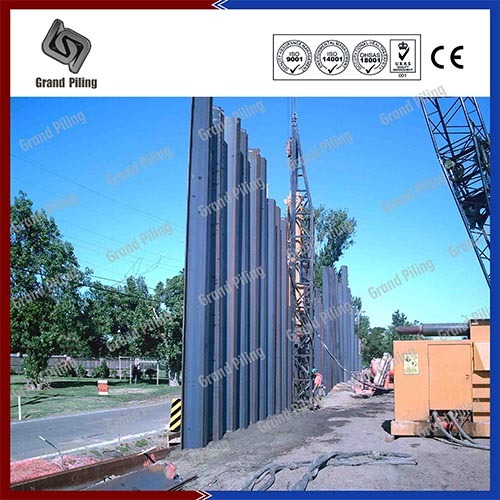 Totally 870 tons of sections are used The project was split in two phases: the construction of a new weir between the existing weir and the adjacent housing complex.The sheet piles had to be driven into a deep-seated impervious layer, overlain by a relatively dense soil layer. 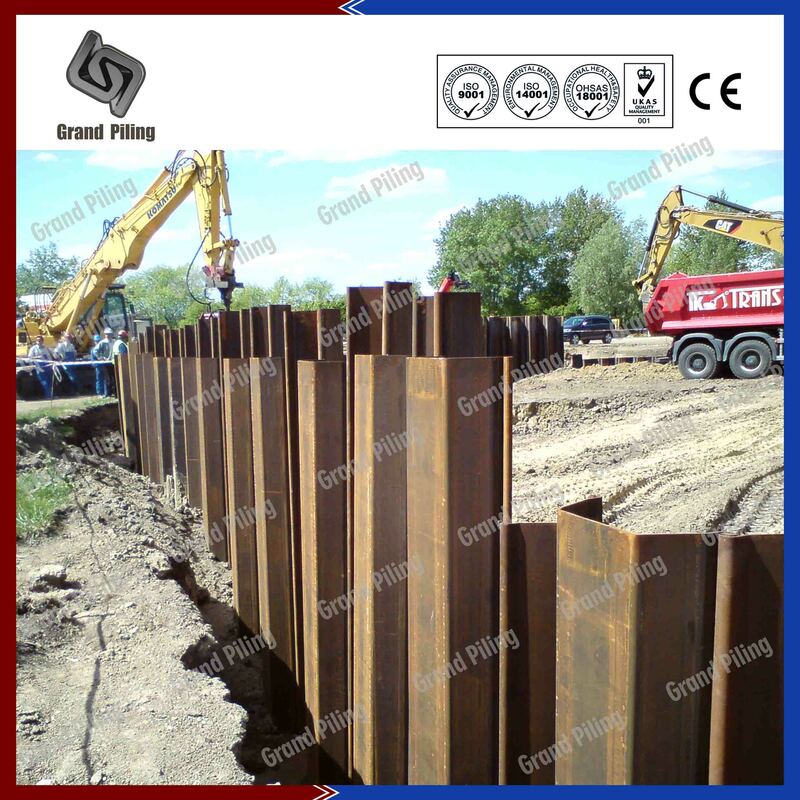 Due to the requirement of penetrating into the impervious layer, the sheet piles installed in the cofferdams had to be up to 21.75 m long. 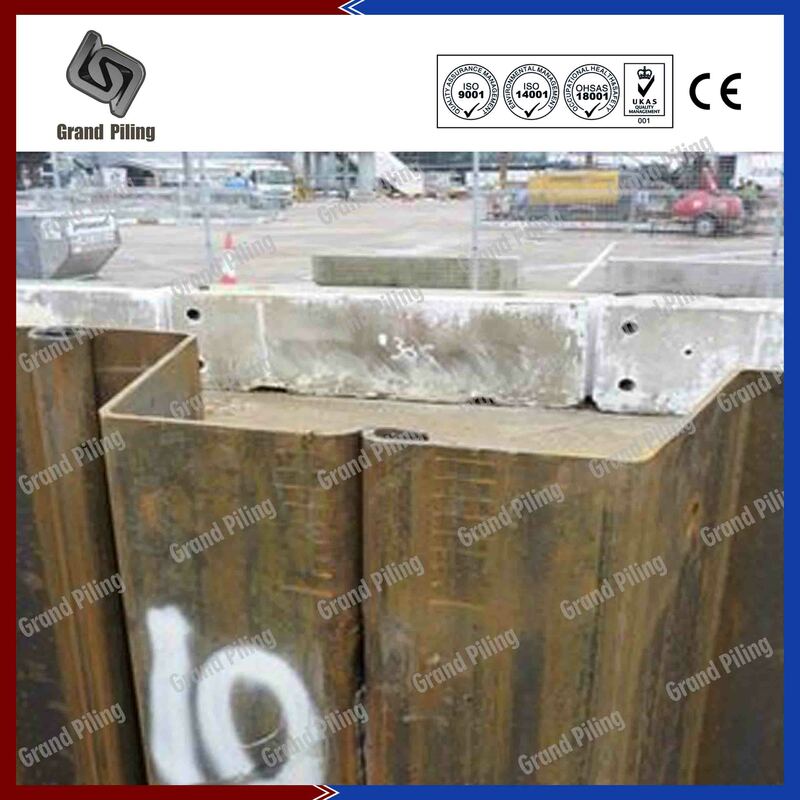 All the loading cases, including the ‘installation’ case, could be verified with theses sheet pile sections. 8. Water Irrigation Project, Venezuela. Project Details: This project is design based on our catalog and brochures. 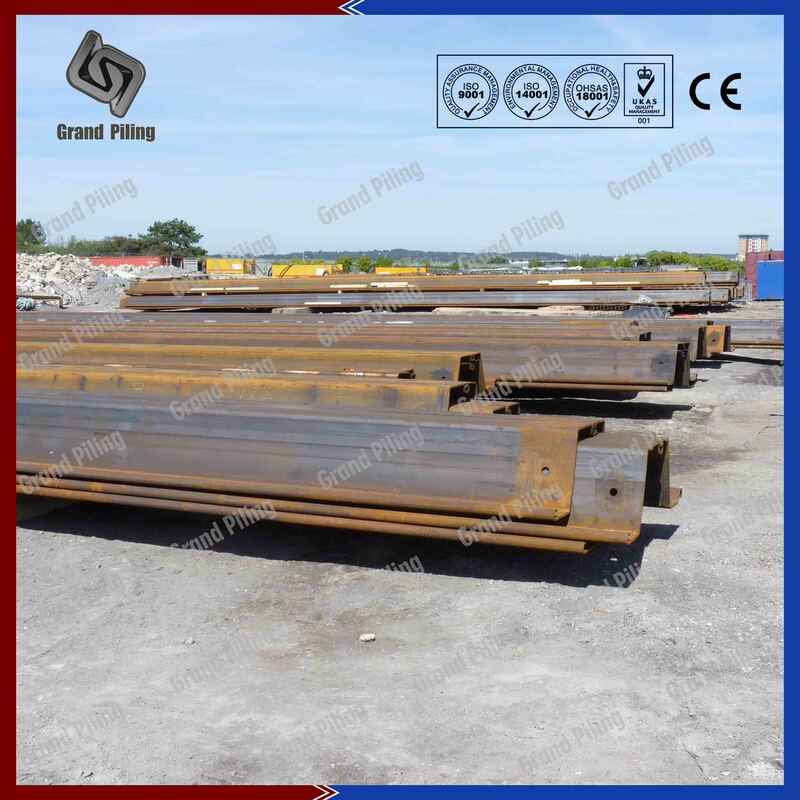 We offered new GPZ 17-700 section, which was accepted and ordered by the customer. 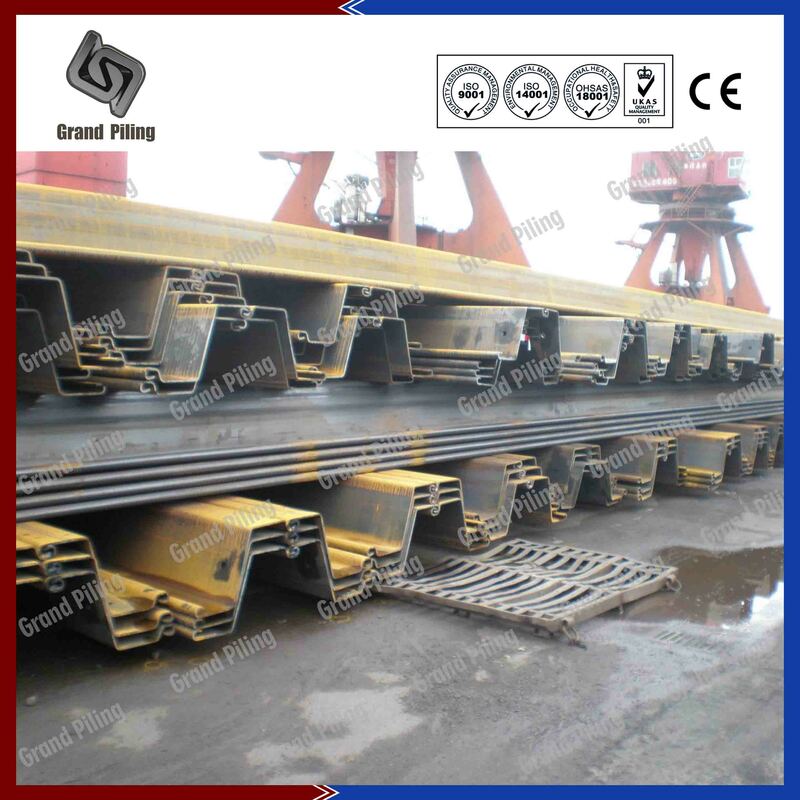 Totally 3500 tons in 11.8m standard length are required. 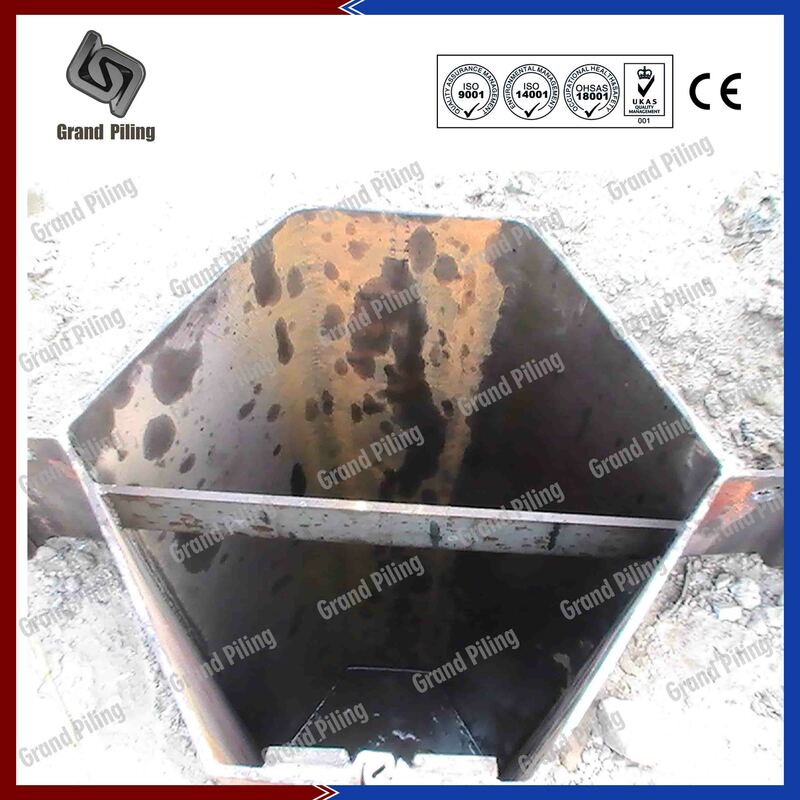 Steel grade ASTM A690,specially ordered for this job. 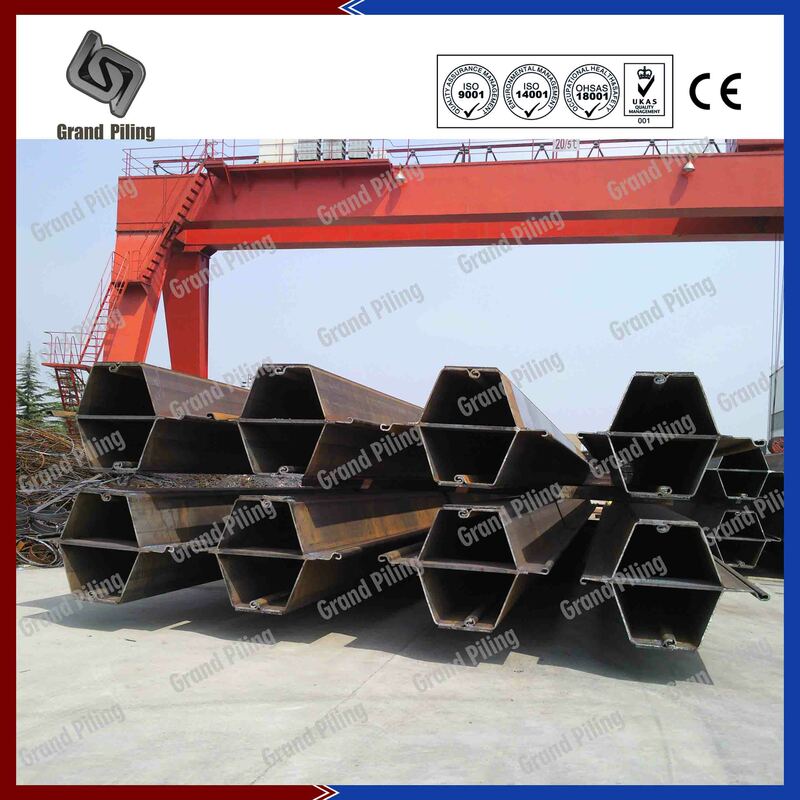 A690 steel grades has been weather resistant performances. 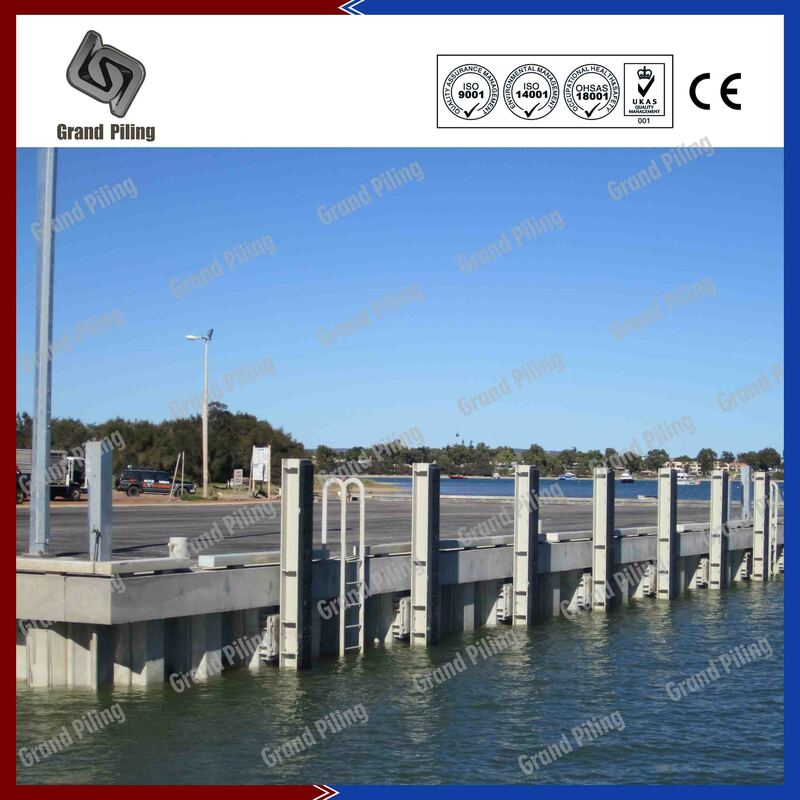 The job has been accomplished successfully based on a long-term collaboration with the design engineer and the project owner. 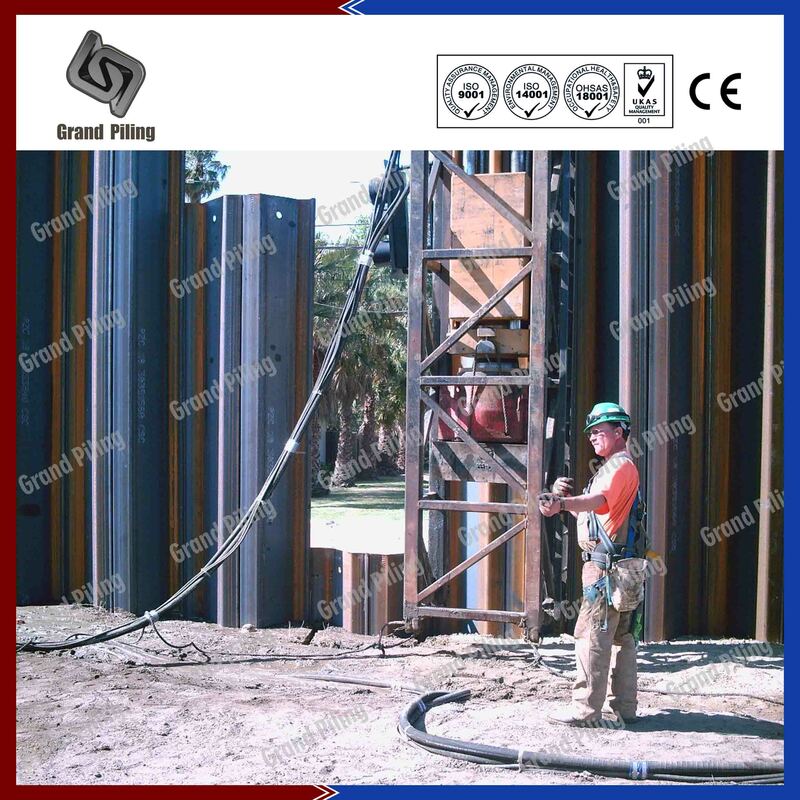 Another reason for success was the availability at the right moment of the first “Sill Worker” Press which can handle and install 700 mm wide GPZ-piles. 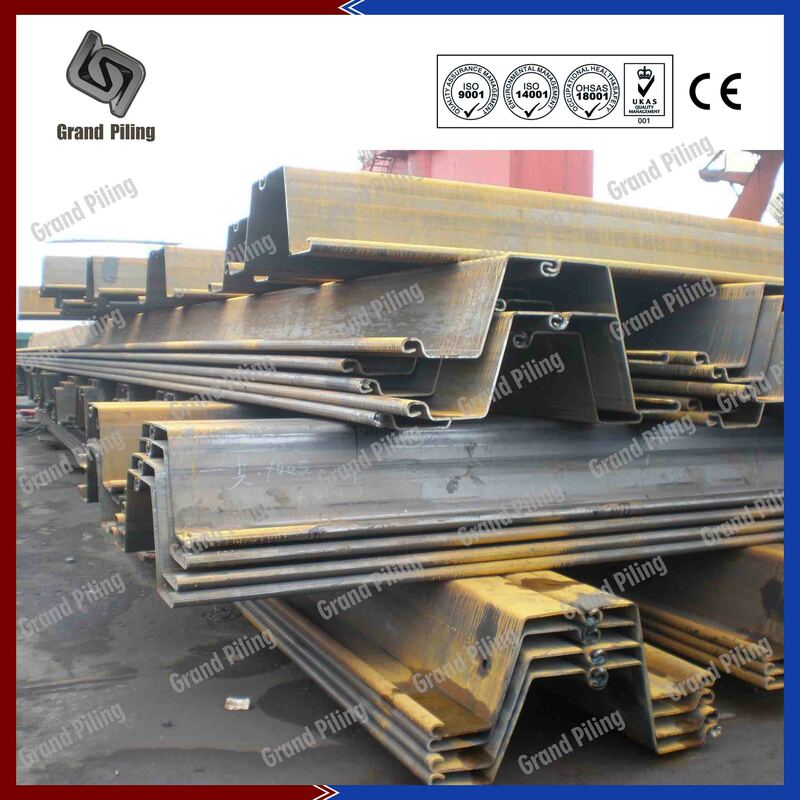 Project Details: Totally 2855 tons of box piles was shipped to Canada,by break cargo.Around half are GPU25-650 GPU12-600 U type sheet piles,and half are GPZ32-700 steel sheet piles,all cutting and welding jobs were done in China. 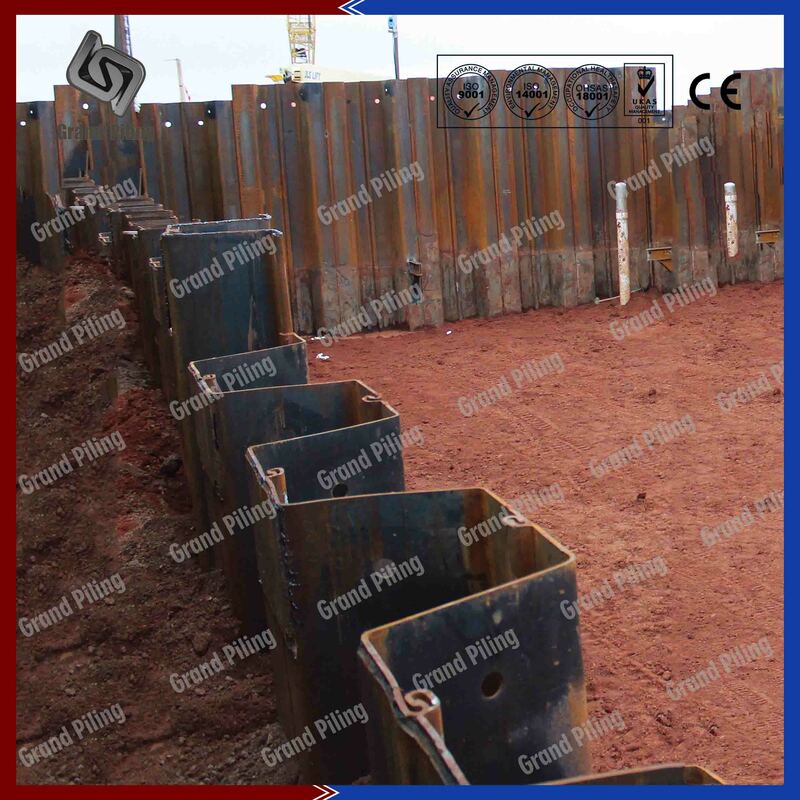 Project Details: 1800 tons of GPU14-600 600x360x10 in S355 steel grade,all in 11.8m,container shipment .Soil conditions were very stiff to hard, bouldery clays with considerable buried debris from previous land reclamations. 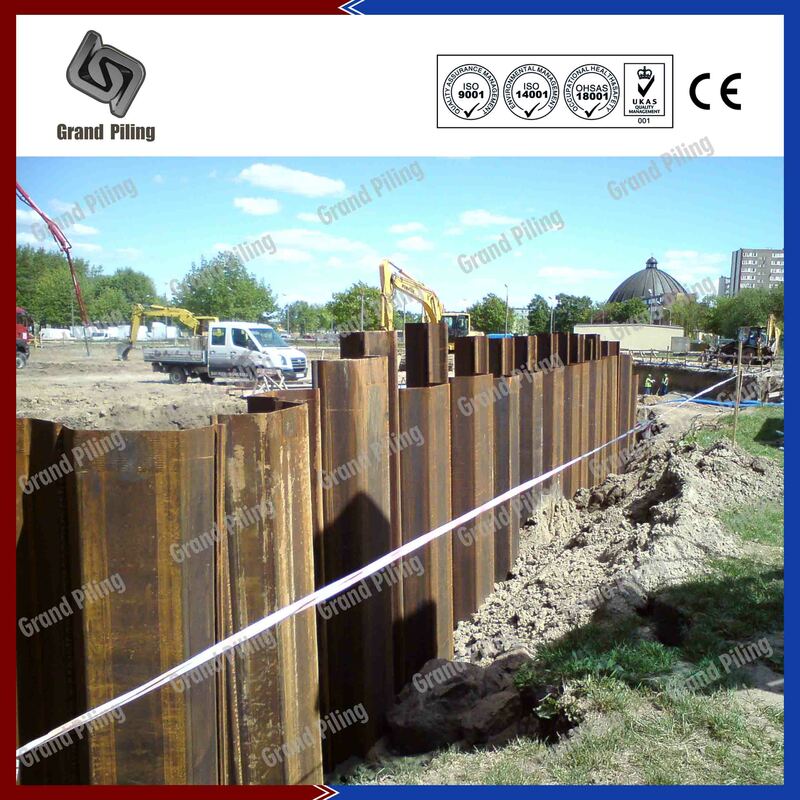 Sheet piling with modulus of section around 1400 was required.Major telecommunication, electrical, gas and water lines passed through the site. 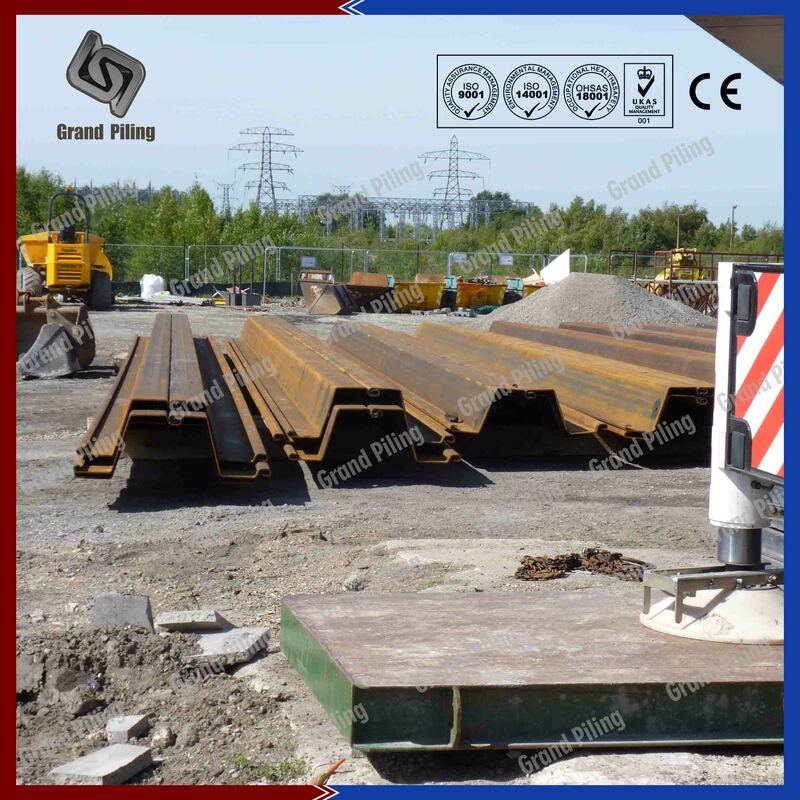 To negotiate the services, the sheet piles were combined with Universal Beam Posts and timber lagging to cater for the service lines. 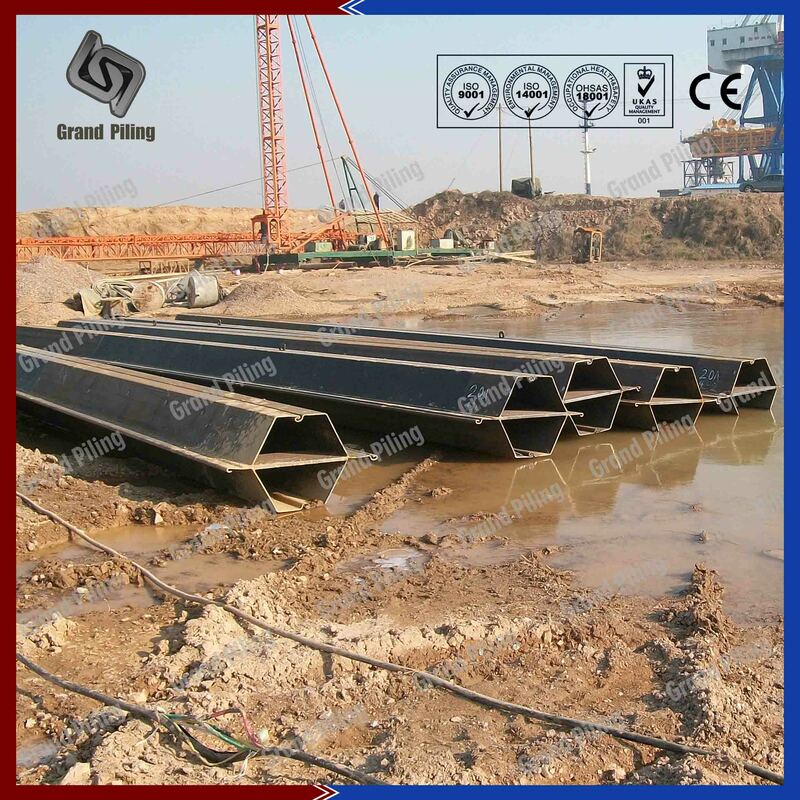 Sheet piles were interlocked with the I Beam straddling the service lines. 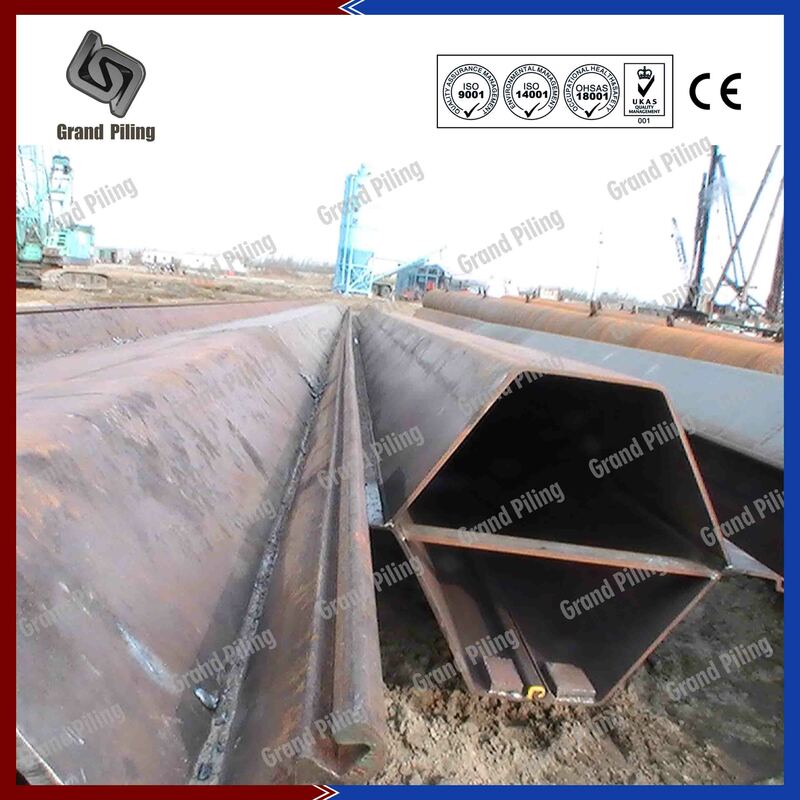 The pipe clutch on the sheet piles provided a water tight seal for the entire depth of the 11m deep excavation.